The judge’s remarks on your dressage score sheet are intended to act as an aid to your schooling at home. The judge will point out areas that need work, as well as those that are pleasing. If you’re new to competing, some of these comments can be a little confusing. 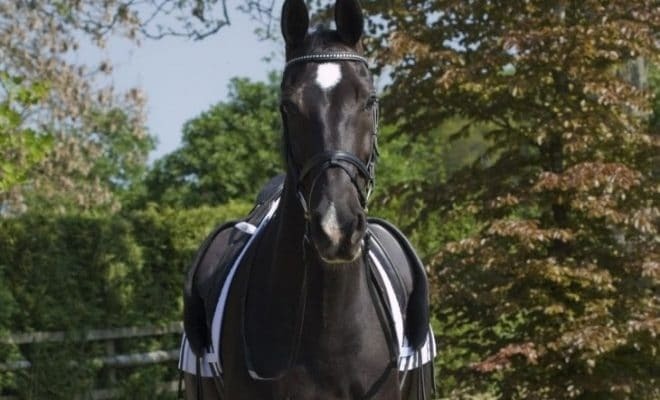 Here’s a glossary of commonly-used judges’ remarks to help you to get the most from your dressage tests. This is the first remark you’re likely to encounter as the judge assesses your center line at the beginning of the dressage test. It refers to the horse’s quarters pushing left or right of the center line as he attempts to evade taking the weight back onto his hocks. You might also get this remark in the canter work if the horse’s quarters come in along the long side of the arena; again, this is a balance issue. This comment refers to the impression that the majority of the horse’s weight is on his shoulders, and his balance is therefore downhill. This way of going is typical of young horses that are not yet engaged enough to carry the weight back onto their hindquarters. This refers to the fact that the horse is not working over his back through into a round frame and elastic contact. The horse will carry his head too high, allowing his topline to hollow and his hocks to trail. You might see this comment on your score sheet if your horse has been distracted by his unfamiliar surroundings and has become worried or anxious. Tension can manifest itself through spookiness, tightening through the topline, not going forward, shortening of the steps, losing correct rhythm. You could see this comment if your horse loses engagement into the halt, or in the medium trot or medium canter. In order to evade taking the weight back onto his hocks, the horse simply splays his hind legs. This remark describes the horse whose nose is no longer on or slightly in front of the vertical. Sometimes, due to tension or lack of balance, the horse will shorten his neck and tuck his head into his chest. This can also be a way of showing resistance to the contact. It is most commonly seen in horses that are ridden in a double bridle, as they attempt to evade the action of the curb. This comment is made when the horse’s rhythm is not consistent. Often, the rhythm is variable due to tension or because of a momentary loss of balance through a turn of after a transition. “Irregular” is a comment you definitely don’t want to see on your scoresheet! 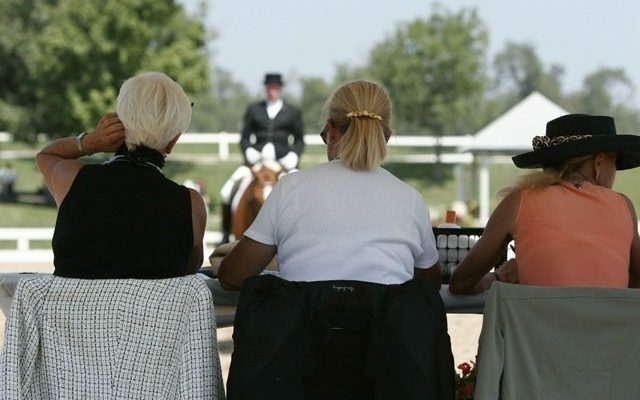 Judges are taught not to use the words, “lame” and “unlevel.” That’s because riders have been known to send a letter from their vet to dressage committee insisting that their horse is sound after a judge has commented on its lack of soundness. So, if a judge deems a horse to be momentarily unlevel or “not quite right,” you will see the comment, “irregular” on your scoresheet. In cases of very marked lameness, the judge will stop the competitor and tell them that, in their opinion, the horse is unsound. If this happens to you, you should retire, or you may be eliminated immediately on horse welfare grounds. 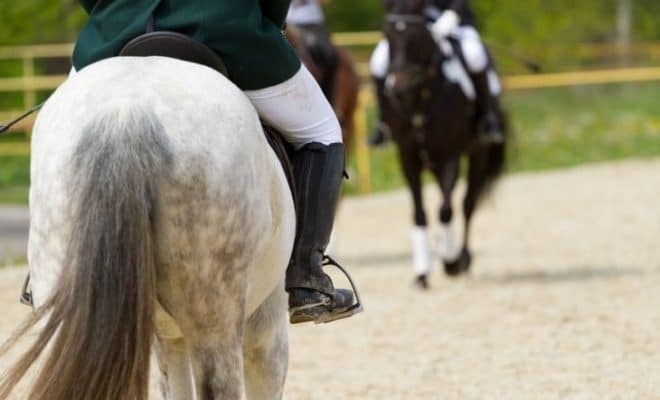 A canter that is flat and lacking impulsion is sometimes commented on as, “lacking jump.” That can be a common error that riders make when attempting collected canter in the early stages of the horse’s training. “Needs more ground cover” is often used to describe a weak medium or extended trot or canter that lacks ground cover, i.e., the steps are too short. Sometimes, you might get this comment against a free or extended walk for the same reason. 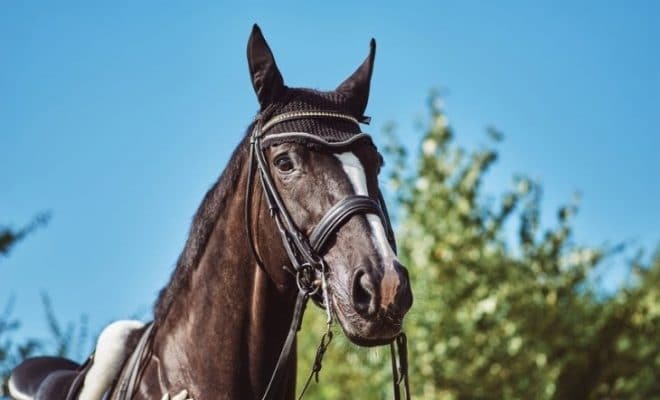 You’ll get this remark if your horse tips his head to one side, usually around a small circle or any exercise that requires the horse to flex at the poll and bend uniformly through his body. This remark refers to a horse that is not going forward from his rider’s leg. Sometimes, a horse will contract his neck away from the contact, rather than working through his neck to seek the bit. This fault often occurs when a horse is being ridden in a double bridle, and the rider is using too much curb rein. If the horse halts with a leg trailing, you’ll be penalized for the halt not being square. 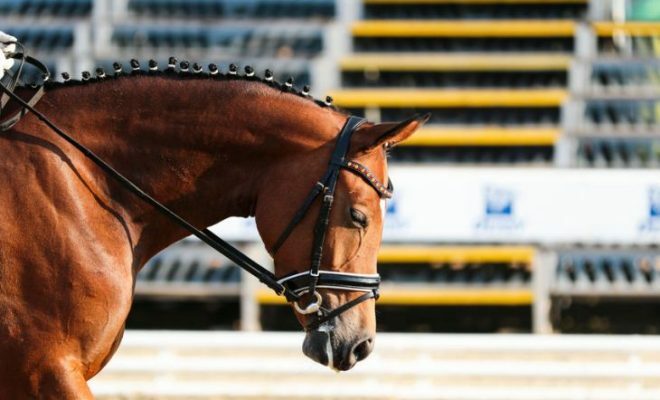 If the horse fidgets or the rider salutes immediately and then leaves the arena, you may see the comment, “Immobility not maintained” on your scoresheet. “On two tracks” refers to the horse being crooked. The horse should move as if on railway tracks, the hind feet stepping into the prints left by the corresponding forelegs. If the horse is crooked, you will see that he is moving on two tracks instead of one. This comment will be used for the walk and occasionally trot when the judge sees that the steps are too short. The hind feet should step into the prints left by the corresponding forelegs. Tension is often a cause of this fault, although it can happen if the walk is over-collected. This comment is used when a medium trot is merely a faster version of working trot. The horse covers no extra ground, but rushes or runs instead. When you ride a circle, you must ensure that it’s the correct size and round, not square or oval-shaped! You’ll get this comment if you’ve ridden a circle that’s not placed correctly. For example, if a 15-meter circle should be ridden at “A,” the center of the circle’s circumference should be at “A,” not a meter or two to one side of the letter. This comment applies to serpentines. Each loop of the serpentine must be the same size. High behind or croup high refer to the same fault in the horse’s way of going. This comment is usually given for canter work, transitions, or flying changes, and refers to the horse’s croup popping up while the forehand remains on the ground. This comment refers to a transition that’s not ridden forward, especially from the trot or walk into canter. If the horse’s hocks are out behind him instead of stepping underneath his body to take his weight, you might get this comment, usually applied to medium or extended trot or a halt. This comment is used to describe a transition where the horse comes above the bit and loses balance, usually because the connection through his back to the rider’s hand is momentarily lost. You might also see this remark when the horse loses his balance and outline during the medium trot. When you ride the rein-back, the horse’s legs must move in clear diagonals. If they don’t, you’ll get this comment. In rein-back, the horse must take clear, clean steps in a diagonal sequence. Sometimes, horses drag their feet and hurry backward. That’s when you’ll get this comment. If the horse drifts away from the track or through the corners of the arena due to lack of balance, you’ll get this comment. Horses often fall out through the shoulder when in shoulder-in or when executing small circles. That is a serious fault that usually indicates a lack of lateral suppleness or balance. You’ll get this remark if your center lines aren’t straight and you allow the horse to wander or drift. This comment refers to the horse using his inside shoulder to prop himself up around corners and circles as an evasion to using his inside hind leg to balance himself. This fault also indicates a lack of suppleness to the bend. This remark refers to the “give and retake the reins” exercise. The judge may say, “G&R not clear” if you didn’t clearly release the contact. So, make your give and retake very obvious to avoid receiving this comment! This comment refers to a barely discernable give and retake of reins! Try to give and retake the reins over three strides so that you can’t be criticized for being too brief. 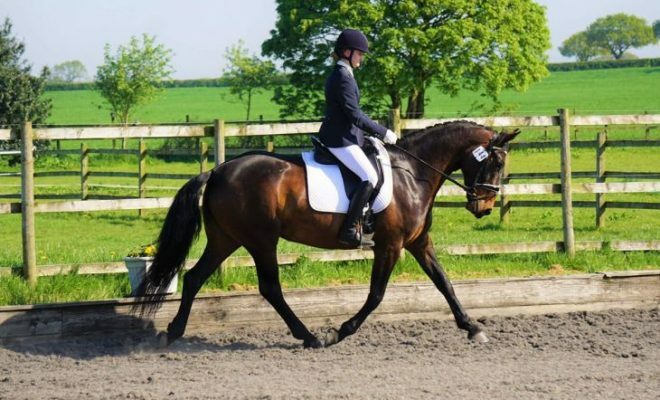 That happens when the horse loses his rhythm, and his hind feet stop stepping, typically if the pirouette is made too small for his stage of training or he loses activity. Stepping out is another fault in the pirouettes. Instead of his hind feet describing a small circle, the horse steps out with one hind leg to avoid the exercise. You’ll get this remark for a half-pass or leg yield where the horse loses the correct positioning and his quarters are left behind. Quarters leading or quarters in advance is a term that’s used to describe a half-pass where the horse’s hindquarters appear to be moving ahead of his shoulders. 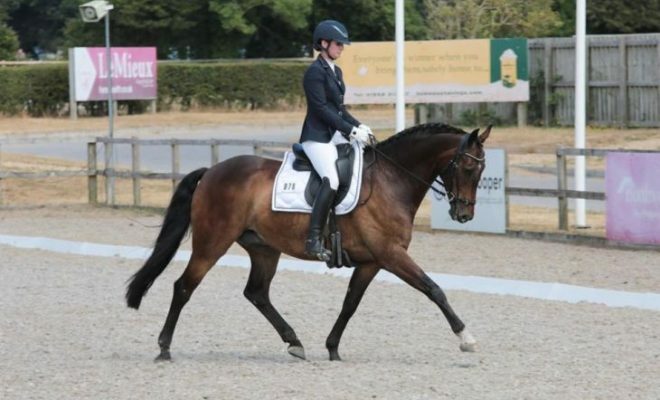 These are probably the most commonly used terms on your dressage sheet that might require further explanation. If you don’t understand something the judge has written, don’t be afraid to ask for clarification; most judges are very approachable and are happy to explain what they mean.